This is from La Repubblica 1998. 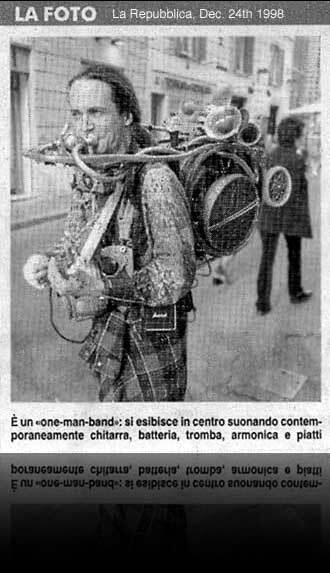 Translation-"He's a one man band and performs in the center of Rome playing guitar, drums, trumpet, harmonica and cymbals." This is a very minor example of how the press screws everything up or just writes whatever it pleases...I'm playing the banjo, not the guitar, there's a trombone and tuba but no trumpet and I do not play the harmonica!